About a hundred people gathered for the first ever Code for the Kingdom @ Microsoft this past weekend. We prayed, worshiped, hacked (kids did too! ), pitched and celebrated–it was an amazing time. If you’d like to get involved, we’re preparing for the Code for the Kingdom Seattle Hackathon from October 2-4th, 2015. Visit the page to get in touch. I’ve had an AMAZING time @ #C4TK hackathon @ Microsoft. It’s been encouraging to see believers @ this company come together for this event. More Photos My thoughts on the winning projects. Do you think God wants you to? Do you feel bad for not doing it? Are you tired of people (or yourself) telling you you should? Do you “play it safe” by sticking to comfortable passages you are familiar with? Passages that seem relevant? Or maybe you wish you had a way to help others enjoy more of God’s Word? What if technology could help you & others enjoy the whole counsel of God? In an age when the Bible is freely available in apps and online, it can be tough to find innovative ideas in this space, but the Holy Spirit is never short on creativity :-). 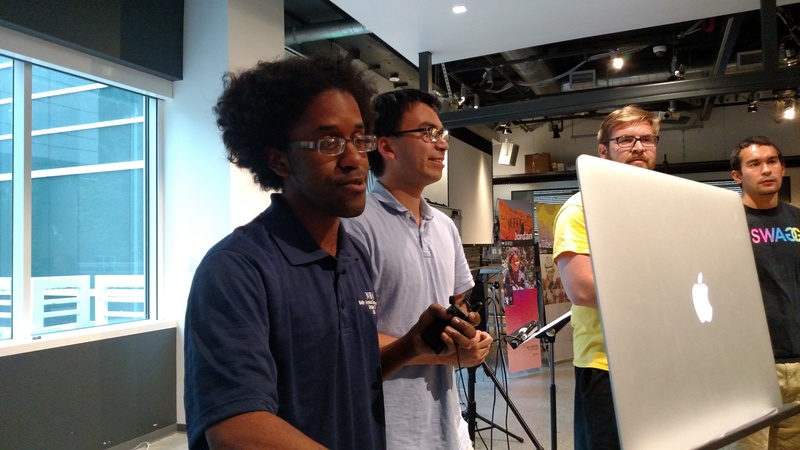 Teams at the recent Code for the Kingdom @ Microsoft hackathon (pics & tweets here) produced 3 tools to help you engage with and enjoy ALL of God’s Word. (Note: since they were built in less than 24 hours, you can play with the demos, but they aren’t production ready yet). A team of four amazing interns (Eric, Jamar, John, Shane) built a website that helps people discover more of the Bible through machine learning. Users start by entering a passage they are familiar with. They read the passage and when they click next, they get a related chapter of the Bible they they have not read yet. The team used topic modeling with non-negative matrix factorization to automatically calculate relevance scores between chapters of the Bible. These scores, along with a vector of which chapters the user has already read are used to determine what chapter of the Bible someone will get next. 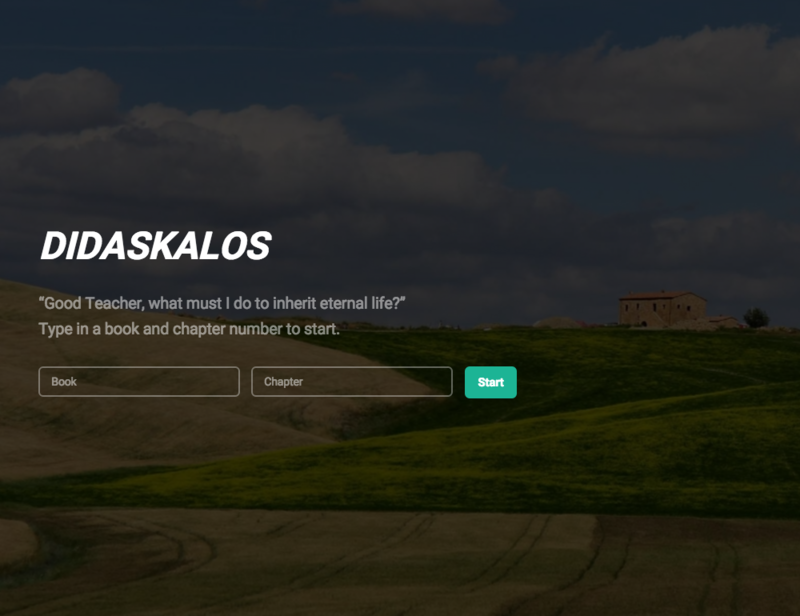 By reading four related chapters every day (you can think of this like an automatically generated adaptive Bible reading plan), people can read through the entire Bible by beginning with familiar texts and branching out to related parts of the Bible they have not read yet. These juxtapositions produce new insights. Alfred, a developer with the Bing team wanted to rank Bible verses using Bing search volume statistics. 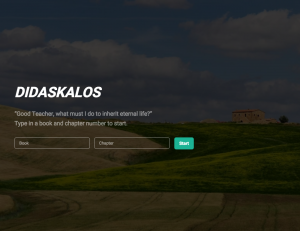 By visualizing it into a “social” Bible reading experience, he discovered something stunning. 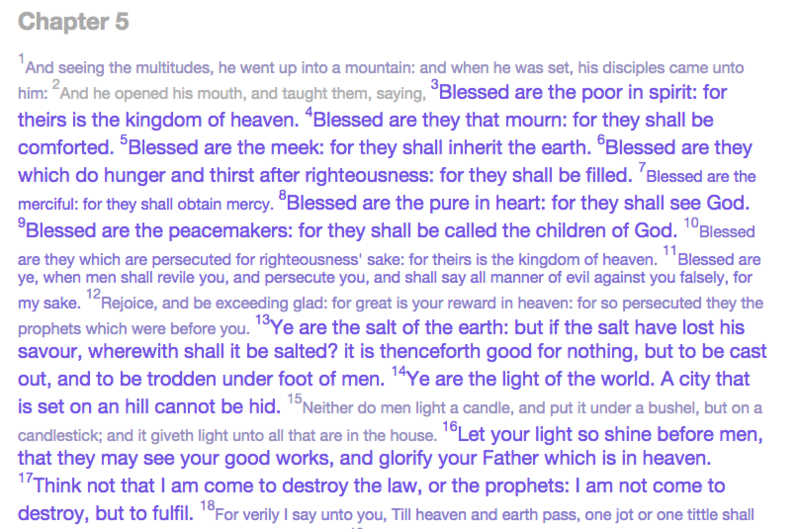 The most popular verses are shown in big purple font. The least popular verses are shown in gray small font. Thankfully, the beatitudes are quite popular and important to the body of Christ. But did you notice that verse 7 and 10 are smaller? Why are these verses less searched for? Hmm…maybe it’s time for your pastor to preach about that :-). 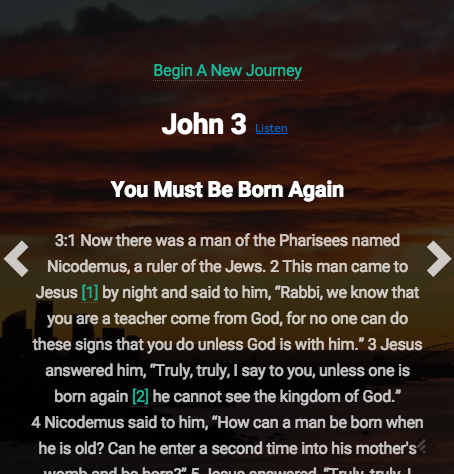 Scripture Insight provides a social reading experience where people can see what verses are important to the Body of Christ as well as what verses may be overlooked. And this helps us pay attention to everything God is saying, not just the passages we like. Find your own social Scripture insights by reading through Matthew here and share what you discover in the comments. Okay, this is for all the software developers out there. 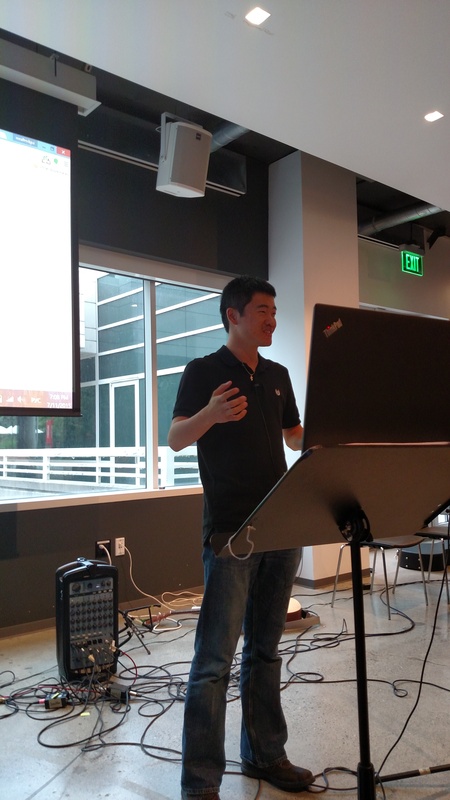 Hacker Wonseok built a Visual Studio integration that lets F# developers conveniently access Scriptures right from their editor. 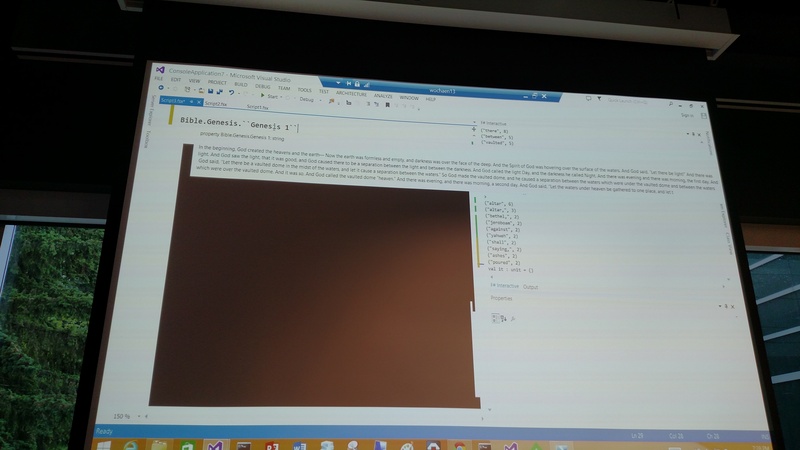 He used TypeProviders and the FaithLife API so that Intellisense can provide autocompletions for Scripture citations and texts. If you’re a data scientists or developer you can be reading the Bible while pretending that you’re working…and you can easily write programs with Scripture content, whether for textual analysis, natural language processing of Scripture data, etc. Wonseok did a demo of getting ordered term frequencies for a passage of the Bible with one line of code. And if this technology is adapted for a general editor, I think it could be an elegant user experience for pastors and authors writing about Biblical content. Authors can pull in Scriptures without ever having to leave their editor to search or copy and paste since everything would be available as an autocompletion. And when you make it really easy to look up, include and reference Scripture in your sermons, you often end up with more Scriptures in your messages, so that your audience is exposed to more of the whole counsel of God. This is what happens when you start with God as your customer and work backwards. You get technologies that are not merely solving a problem or felt need for people, but you get inventions that help people do more of what God desires–in this case engaging with, enjoying and obeying EVERY word of God. Instead of building yet another Bible reader, these teams have created innovative ways to help people enjoy the whole counsel of God. When you make God your customer, you invent products that transform people’s lives by helping them pay attention to all that God says and not just what they like. When you make God your customer, you end up creating something…prophetic. It doesn’t simply conform to market demand, but transforms the markets to fit with what God desires. You deliver a foretaste of God’s Kingdom. If you’d like to be part of a community practicing technology entrepreneurship for the Gospel (beginning with God as your customer and working backwards to invent products that deliver what He wants to see in the world), check out http://www.theotech.org.